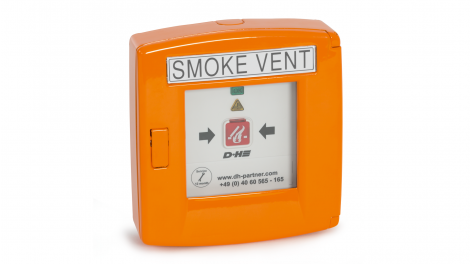 The SHEV systems from D+H ensure safe smoke and heat exhaust ventilation and guarantee smoke extraction from stairwells or lifts. Our CDC Series chain drives can be integrated perfectly into window profiles. They are virtually hidden in façades and roof windows and installation is quick and easy. Powerful and fast: Our rack and pinion drives have an opening speed of only 60 seconds in an emergency. Window locking drives provide the best burglary protection. Our skylight systems and louvre drives are tested and approved in accordance with the NSHEV standard (natural smoke and heat exhaust ventilator) DIN EN 12101-2. We are available for consultation and will calculate the geometric and aerodynamic smoke extraction. Nearly all drives from D+H can be supplied with both an output voltage of 24 V and 230 V and feature BSY+ synchronous control. Interaction between the SHEV control panel and the SHEV drive is possible thanks to the new bus communication, Advanced Communication Bus (ACB). In addition to NSHEV-certified products, D+H also produces solutions for controlled natural ventilation in accordance with DIN 1946-6. Our VCD Series, which we recommend for use in façade windows, roof windows and ventilation flaps, has been specially developed for controlled natural ventilation. The BDT Series is also exclusively responsible for ventilation and cross ventilation. The fitting drive opens window sashes evenly on all sides. This parallel opening makes gap ventilation of up to 6 mm possible. The 24 V VCD 203 chain drive is especially quiet when opening and closing façade windows, making it ideal for daily ventilation operation. Our most compact window drive for mounted installation, with 200 N force of pressure and with a stroke of up to 250 mm. The 24 V VCD-0203-1-ACB chain drive is ideal for ventilation purposes thanks to its Advanced Communication Bus technology. Based on the Modbus RTU protocol, all ACB drives can be easily integrated into an existing building management system. VCD 203's big brother: Our VCD 204 chain drive ensures fresh air every day with windows that open up to 350 mm. The aesthetic solution for reliably opening and closing façade and roof windows. Our set for larger ventilation windows with a safety cut-off: Two chain drives in tandem operation communicate with each other in the VCD 204-TMS+ Set and work together to ensure twice the force. Power supply that can be looped. Not quite as compact as the VCD-0203-1-ACB but offering a longer stroke: The VCD-0204-1-ACB chain drive opens your windows up to 350 mm. Thanks to ACB technology, all drives can be controlled with precision down to the millimetre. The VCD 204-K is the 230 V model of the VCD 204 for controlled natural ventilation. The stylish chain drive for daily use can be connected directly to a button and can be used without a control panel. The VCD 204-K-TMS+ Set includes two compact 230 V chain drives for daily ventilation. Equipped with an integrated TMS+ tandem safety cut-off for simultaneous shutdown in the event of failure or overload cut-off. Can be used without a control panel. Integrated into the profile or mounted: the CDC-0252-0350-1-TMS+ is the most compact drive in the series at 350 mm. The TMS+ tandem safety system ensures that the chain drives in tandem are switched off as soon as one of them hits an obstacle. Incredibly quiet and hardly visible: the CDC-0252-0800-1-TMS+ is the largest drive of the CDC-TMS+ series at a stroke of 800 mm. As in the smaller variants, the noise emission during opening and closing have been reduced to extremely low 35 dB(A) so that the drive is barely audible. Super quiet drive technology, can be integrated in the profile: Our CDC-0252-0350-1-ACB chain drive with the most compact design of the series features a stroke of 350 mm. Thanks to ACB bus technology, multiple drives can be activated at the same time. Universal chain drive for profile-integrated or mounted installations: The CDC-0252-0500-1-ACB meets up-to-date design and function requirements. Featuring a 500 mm stroke, it makes virtually no noise when opening and closing your windows thanks to intelligent drive technology. Incredibly quiet and nearly invisible: Our CDC-0252-0600-1-ACB chain drive with a stroke of 600 mm can be integrated into wood, aluminium and plastic profiles. Thanks to smart decoupling in the drive technology, it is virtually silent. Likely the quietest way to automatically open windows: We reduced the sound pressure level of the CDC-0252-0350-5-ACB chain drive to a minimum. 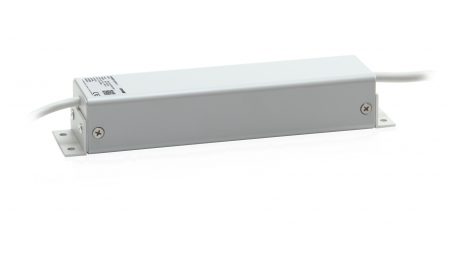 The 230 V power supply unit has smaller cable cross-sections and reduces costs. Can be used in almost all air/smoke ventilation scenarios: Our CDC-0252-0500-5-ACB chain drive is supplied with 230 V of power. This makes installation even easier. You save time and money. Quiet star performer: When the CDC-0252-0600-5-ACB chain drive opens your windows, there is hardly any noise. It features a stroke of 600 mm and can be integrated flawlessly into building automation thanks to ACB bus technology. The largest design in the series: The CDC-0252-0800-5-ACB features a stroke of 800 mm. 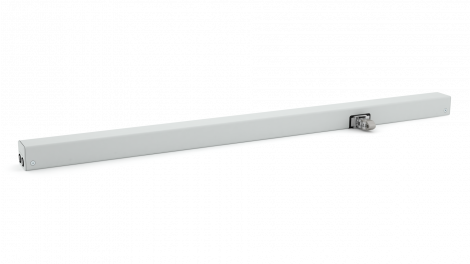 This enables our chain drive to create an incredibly large opening width for your windows. Perfect for natural ventilation and smoke and heat exhaust ventilation. You can even open larger windows with almost no noise: Our CDC-TW-0502-0500-1-ACB chain drive consists of two chains in a housing. The advantage: Double the power, but installation is just as easy. Double the power and a consistent load distribution on the window sash: The CDC-TW-0502-0800-1-ACB features two chains, each with a stroke of 800 mm. As a result, it can open very large windows. Extremely robust, durable and reliable: Our KA 34 SHEV chain drive is the timeless classic with 300 N for mounted installation. Can be used nearly anywhere thanks to a variety of bracket solutions. Reliability in 230 V: The SHEV KA 34-K chain drive offers many advantages for easy installation and opening windows conveniently. KA 34's big brother: Just as robust and reliable but the KA 54 SHEV chain drive is significantly more powerful with 500 N. Exceptionally flexible and universally applicable. For mounted installation. Universally applicable, extremely robust and flexible as a result of its design: two powerful KA 54 SHEV chain drives in a set, supplemented by BSY+ technology for control down to the very millimetre. Only for mounted installation. BSY+ chain drive set with 230 V output voltage: Our special production, the KA-K-BSY+ Set, consists of two drives each with a force of pressure of 300 N or 500 N.
Doubled tensile and force of pressure with equal load distribution on the window sashes: Our SHEV KA 66-TW chain drive features two KA 34 drives in a single housing. For simplified installation and low maintenance and service costs. The same functions and performance values as the KA 66-TW, but with a direct supply of 230 V: Our KA 66-TW-K has two chains that open window sashes evenly with a force of pressure of 300 N each. One of the most powerful chain drives on the market: The CDP 1500-BSY+ handles heavy window sashes and NSHEV roof windows with 1500 N, even with high snow loads. Our heavyweight for powerful SHEV and ventilation applications. The heavy duty drive for the most stringent requirements for force in the 230 V variant: The CDP 1500-K-BSY+ also opens very large, heavy façade and NSHEV roof windows using BSY+ technology with the force and position synchronised. Power supply that can be looped. Our most powerful SHEV chain drive: The CDP-TW 3000-BSY+ for very large glass designs is used in shopping malls, airports and everywhere else there is a need for maximum force and the toughest architectural demands. Appealing design thanks to its narrow construction: The CDP-TW 3000-K-BSY+ opens large NSHEV roof windows as well as heavy windows and flaps. A synchronisation of up to 2 drives is possible using BSY+ technology. The ZA-0800-1-PLP is the all-rounder of our rack and pinion drives: It provides the perfect balance of current consumption and power. It is more powerful than the ZA-0300-1-PLP with 800 N of force of pressure and tensile force. Synchronised drive set with a high-speed function: This set consists of two rack and pinion drives, each with 800 N of force of pressure and tensile force. The high-speed function ensures windows can be opened quickly. Reliable roof expert with ACB technology: Our ZA-0800-1-ACB rack and pinion drive opens and closes heavy windows and skylights with ease. By means of the integrated bus system, all status messages, such as the exact opening stroke, OPEN and CLOSED status, etc. can be read out. Our ZA 105-BSY+ HS Set meets the most stringent requirements. Equipped with the BSY+ and the high-speed function, this set gives you the ability to switch eight rack and pinion drives synchronously in one group, making it possible to open several windows in just 60 seconds. The perfect balance of current consumption and power: At a low current draw of a maximum of 2.5 A, our slender ZA-1000-1-ACB-HS rack and pinion drive is capable of very high forces up to 1,000 N. Equipped with the high-speed function, it opens windows in just 60 seconds and thus ensures the highest levels of safety in an emergency. The ZA 105-K provides a boost in performance and durability. This rack and pinion drive applies 1000 N of force of pressure and tensile force, which can be controlled directly using 230 V of voltage. This means a significantly smaller cable cross-section is sufficient and makes installation a breeze. Similar properties to the ZA-K, but with the addition of BSY+: Our ZA-K-BSY+ can control up to four drives simultaneously. Passive closing edge protection is achieved by reducing the running speed to five millimetres per second in the CLOSED direction. The special design enables even load distribution: Our tandem version ZA-TM features low current consumption. A mechanical connecting shaft links two drive units together for evenly applying power to the window. The DXD 150-BSY+ gives you a rack and pinion drive suitable for a force of pressure of 1500 N for SHEV and natural ventilation. Four drives can be operated in one synchronous group thanks to BSY+ technology. Powerful and rugged: Compared to the DXD 150-BSY+, this rack and pinion drive is supplied with a voltage of 230 V. A significantly smaller cable cross-section is required as a result. Our powerful devices combine endurance and power. Our DXD 300-BSY+ has a service life of 20,000 double strokes and a force of pressure of 3000 N. Four rack and pinion drives can be controlled in synchronisation. A force of pressure of 3000 N and direct control using a 230 V supply: The DXD 300-K-BSY+ is our high-performance drive. It is twice as powerful as the DXD 150-K-BSY+. You can control up to four drives simultaneously using the integrated BSY+ synchronised electronics. Safety first: Your windows lock automatically thanks to this drive. The FRA 11-BSY+ replaces the handles on your window sashes and provides an increased level of burglary protection. Compared to the FRA 11-BSY+, this window locking drive is not located on the sash. Instead, it can be integrated into the window profile so that it is no longer visible from the outside. Manual unlocking in emergency situations is possible at any time. User-independent ventilation in accordance with DIN 1946-6: The BDT 010-RC opens your window sashes evenly on all sides using PADM fittings from Winkhaus. This makes gap ventilation of up to 6 mm possible. Burglary protection in accordance with RC2 is also guaranteed while opened. Fitting drive for ventilation without user interaction in accordance with DIN 1946-6: The BDT-1-EO features the same functions and properties as the BDT 010-RC in addition to the innovative EnOcean wireless technology. This makes it easy to connect the BDT-1-EO directly to SmartHome solutions. In the event of a building fire, you need to provide smoke extraction in the roof area and supply fresh air at the lower section of the wall. The DDS 54 opens your doors a maximum of 90° using a force of pressure of 500 N, making your escape routes accessible as well. Bundled power: Our SHD 54-BSY+ side-hung vent drive set consists of two drives that are installed above or below the window sashes. In comparison to the SHD 54, it can open windows with dimensions of up to 1.2 m x 2 m.
Delicate and powerful: Our louvre window drives feature high compressive and tensile force with small dimensions of just 25 mm x 25 mm x 413 mm. The LDE 100 is exclusively designed for EuroLam louvres. Our SDS 2 skylight system consists of a drive unit and a skylight-specific installation set. A force of pressure of 3000 N and a running speed of 11.1 mm/s make this system the optimal solution for opening and closing skylights.